The other day I was kindly invited to attend a blogger's brunch at the boodles store in Liverpool, a place I used to pass each day on my way to work as a Saturday girl in a nearby department store, dreaming of one day owning a boodles ring (or necklace, or bracelet, you know, I'm not fussed). Boodles are collaborating with the famous Liverpool boutique Cricket (aka place of dreams) and several other major brands for #CelebrationOfStyle. #COStyle is a new event being held in Liverpool between 13-15th November including many events held in the most beautiful locations across the city. The celebrations kick off with a dinner in Knowsley Hall hosted by Matthew Williamson himself. I know, I freaked out a little too. There are talks being held at the new Titanic Hotel with a panel of experts including Rosanna Falconer, head of digital at Matthew Williamson, Andrew Collinge, British hairdresser of the year, Tim Bret Day, international fashion photographer, Lorraine McCulloch, celebrity stylist, Cassie Lomas, celebrity MUA and even a lecturer from my very own uni. On the day the panel will be discussing how to get a career in the fashion industry and the exciting digital innovations happening in fashion at the moment. As you can imagine I'm pretty excited for that one in particular! If talks aren't your thing, you can visit the stalls from brands, get a blow dry at the Andrew Collinge styling bar, get your nails done at Nails Inc or even get your makeup topped up by one of the Benefit girls. Talk about luxury, eh? #CelebrationOfStyle is all about the fashion culture of Liverpool, not the 'commercial culture', which has all too often been hijacked in the press portraying us scousers as orange chavs with ankle tags at the races. Fashion is moving up north, and has been doing so for a while. Ever since BBC and ITV moved some of their offices up to Manchester, more companies than you realise have set up camp in the north west, and we're proud of our history. It was only at brunch that I learned boodles is in fact based in Liverpool, with the design team being based in house, just upstairs from where we were sat munching away at our pastries. In fact, one of the boodles designers kindly popped down to talk us over her inspirations for the latest boodles collections, aren't they stunning?! These collections were inspired by mazes and architecture, amazing! 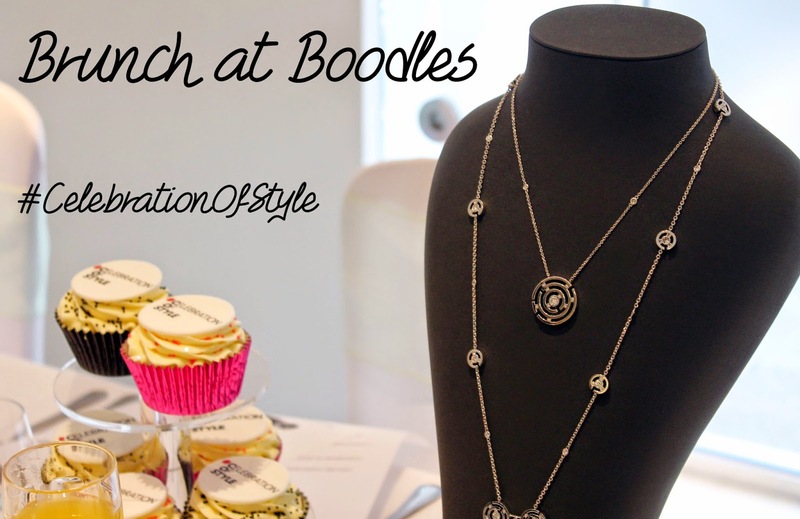 Find out more by following Celebration of Style, Boodles and Cricket on twitter and I hope to see you there! A special thanks to everyone involved as I had the loveliest time, it was genuinely an honour to be there discussing what I love most in such a luxurious setting. I bloody love my life sometimes. Thankyou. I am blogger from India. So jealous of you getting so close to the jewelry from Boodles. Such gorgeous stuff.